The National Azabu local Expat Suppa has free Parking quite a luxury in Tokyo but we live in Minato-ku between the German and French embassies and there are plenty of people who won’t walk the two blocks to get their groceries. I could Have them delivered for free in a few weeks if I didn’t care what I was paying for food and I knew what they had because delivery is free but we don’t have that kind of lifestyle so I carefully formulated my answer. True as it is in the United States of my former life, I never had the time to walk to the grocery store, 4 blocks from home. Now that I’m an expat of all of 3 weeks, it’s summer, I’m not yet scheduled to the point that every minuet of every day is precious. For now my job is simply to make sure everything goes as smoothly as it can at home. Try to discover all we need to make the household function as comfortably as possible. Back in the States if I get the kids to school and their perspective appointments play dates and activities on time, walk the dog, cook the dinner fix, straighten, clean, the house, and when everyone else’s schedule permits I still need to regularly workout to keep my various abused body parts from seizing up; Otherwise leaving me useless to everyone. I have to find time to eat a meal or two and go to the bathroom and I schedule two guys nights a week so I have some time to unplug, though that time can get sequestered into household time too. In I don’t really have only one adult friend other than my wife, not including the neighbors, and it’s not like I can go anywhere without the kids. I have a Helper for now she comes from 9 to 5 two days a week but that gives me enough time to walk to the Supa or the Drug store and try to figure out cleaning supplies and back home. Our Helper Bing Takes the kids to various parks in the area both days she comes too then she cleans the house and dose laundry. During the other days I take the kids to the park or shrines museums we also take the subway or the Chii buss our local bus that is for kids and seniors. this biggest issue is Lennon is always in a stroller and Sofia is riding behind on the platform boring! after 4-6 hours roaming Tokyo she flat out needs to sit down if were an hour or more walk from home we have to keep going and then she’s not even looking around anymore. So here lies the rub to car or not to car I suppose it’s inevitable we’ll get a car because we want to travel outside Tokyo the question lies how much will we use it? I know I probably use my bicycle more to go to the store than the car. I’d like to tell you I’ts because It’s silly to go to the store in a car when it’s so close but the truth of the matter is parking in Tokyo is scarce and parking fines are steep! I would like to have a motorcycle here, I can see getting around a whole lot easier here on a bike, the streets are just more suited for it. Now if I can just pass the second half of the drivers exam. 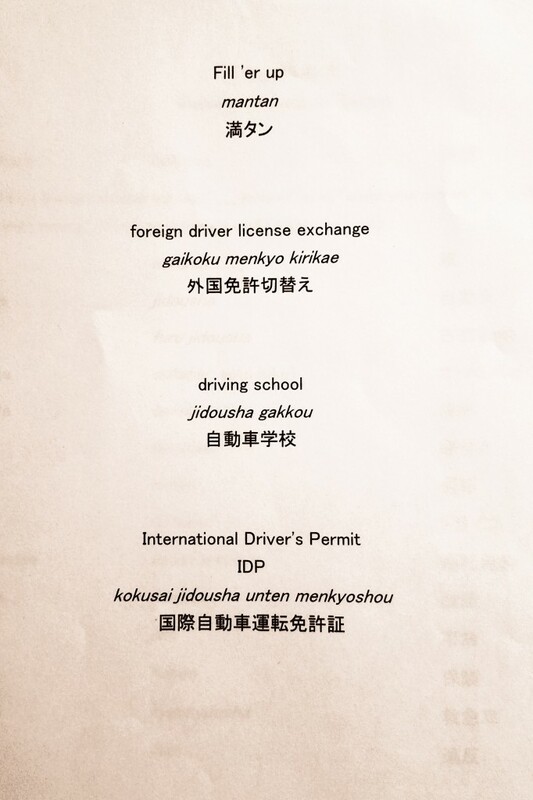 The first half of the drivers exam was given on a computer screen you have to get 7 out of 10 questions right to pass. I got 100%! this is not all that much of an accomplishment the questions are insultingly simple. 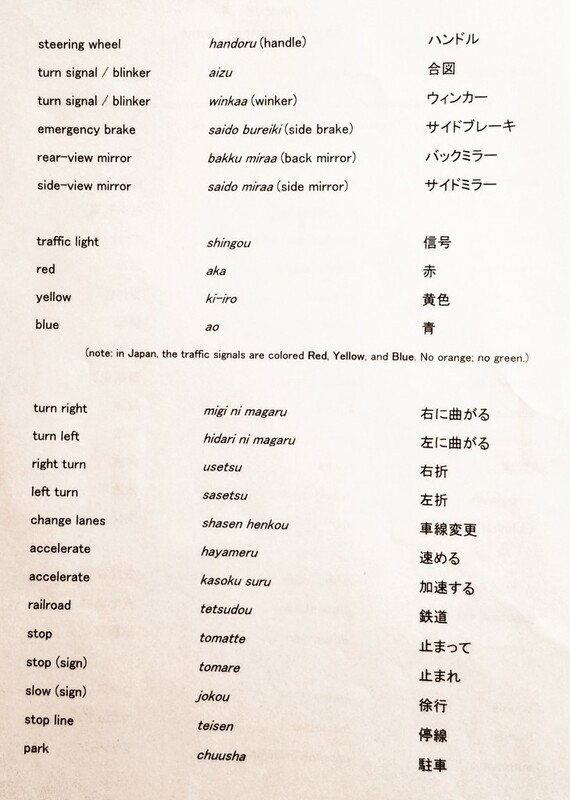 The Road test is Given in Japanese. 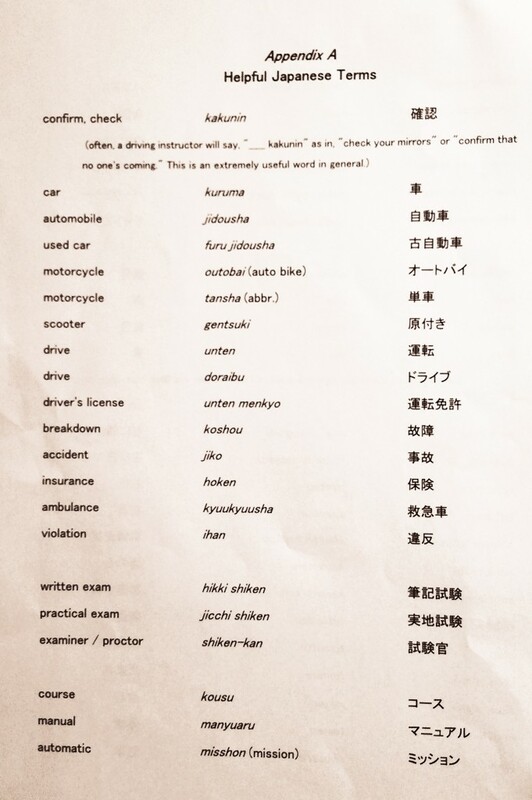 The explanation for this is: You’re in Japan so you should know how to take the road test in Japanese. I’m told the beginning of the lesson will be the instructor explaining this to me even though he knows I don’t understand. They had no trouble explaining you also need a separate licence exam for a manual or automatic car motorcycle over 50 CC and 250 CC. We were given A useful list of terms to memories. When they say safety check the car, they expect you to get outside the car and check all around the car and the undercarriage. I just want to say I’m all new to blogging and actually liked your web-site. Very likely I’m want to bookmark your blog . You really have beneficial posts. With thanks for revealing your web-site.